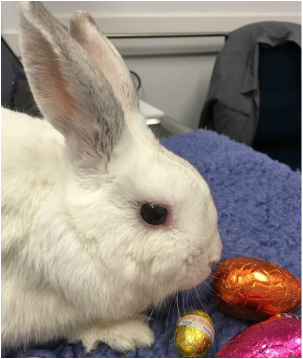 Pictured: this bunny only has one eye and he unfortunately developed a cataract which was affecting his vision. We decided to proceed with cataract surgery to save his vision and now he is doing great! Pictured: this guinea pig developed cataracts and heterotropic bone formation at the age of 2 and has since deteriorated. He is medically managed as surgery for the cataracts could not be performed - he has his eye pressures checked regularly. 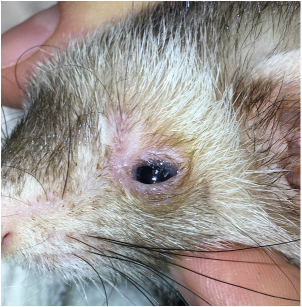 Pictured: this ferret required upper eyelid roll out for entropion, you can see in the image the hairs on the upper eyelid touching the cornea and causing irritation. Cataracts develop in the bird’s eye when there is a deficiency in vitamin E, or from continuous exposure to some artificial lights. 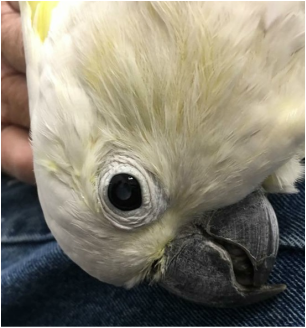 Pictured: this cockatoo had surgery to remove her cataracts. Before surgery, vision loss was causing behavioural changes. Since surgery, she has been much happier and back to her normal, cheeky self.